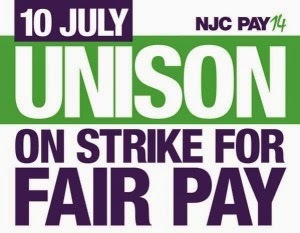 #J10strike A great speech by UNISON’s Sue Glithero in Manchester today outlines why our colleagues in England, Northern Ireland and Wales have been on strike today. She said: “We are the 600 different job types in local government and school support providing cradle to grave services – 24 hours a day, 7 days a week, 365 days a year. Often unseen. But increasingly doing far, far more work to plug the growing holes. For much, much less reward. “We are also the lowest paid workers in the entire public sector. That’s who we are. Scottish Local Government branch secretaries will meet on 24 July to plan th next steps afer a big majority vote by Scottish members for an action ballot.